Are you concerned about frost damage to your crops? There are a number of high-value crops that are critically vulnerable to frost damage. Especially on buds, flowers, and early fruit, frost can cost growers thousands of dollars per acre. For a long time, many growers have monitored the risk of frost in various ways so that they could try to minimize the damage. Growers have used large fans, smudge pots or heaters, and sprinkler systems to prevent temperatures from reaching the freezing point. Because these methods can be expensive, there is also a strong incentive to only take this type of action when absolutely necessary. Unfortunately, for the purpose of frost alerts, monitoring air temperature alone is not enough. The balance of energy on physical surfaces can be different than that of the overlying air. This causes differences in temperature. In particular, on calm, clear nights, long-wave radiation escapes to the much colder sky, which can drive the temperature of objects well below that of the air. 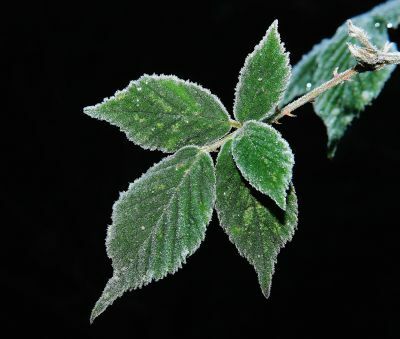 Condensation then occurs and, if cold enough, ice (termed radiative frost) can form on the surface as well as inside the leaf or blossom. Broadly speaking, there are two ways the temperature of a leaf, bud, or flower has been estimated: forecast models and more direct measurements. The forecast models are based on extensive weather measurements (for example, air temperature, relative humidity, wind speed, and net radiation). Many agricultural weather networks offer frost alerts based on their weather station networks and models. For areas not covered by these services, or for growers who would like their own information, there are three types of measurements that can be useful: air temperature, solar radiation, and surface temperature. Air temperature measurements (that are well-shielded from the night sky) and solar radiation measurements can be used. However, as mentioned earlier, air temperature can be dramatically different than the surface of a leaf, bud, or flower. For instance, measurements in Logan, Utah, USA showed that the nighttime difference between air temperature and turf grass surface temperature reached as much as 16 degrees Celsius during the spring. See the figure below, where the green line is surface temperature and the dotted blue line is air temperature. Click the graph for a larger image. A better option is to directly measure surface temperature. Methods for doing this include using a thermocouple or thermistor in direct contact with a leaf or a non-contact sensor, such as an infrared radiometer. Because a number of leaves or buds would have to have sensors mounted to them for thermocouples or thermistors to provide representative numbers, this method quickly becomes impractical. In contrast, the measurement of an infrared radiometer (such as the SI-111 touch-free, optical sensor) can include multiple leaves. 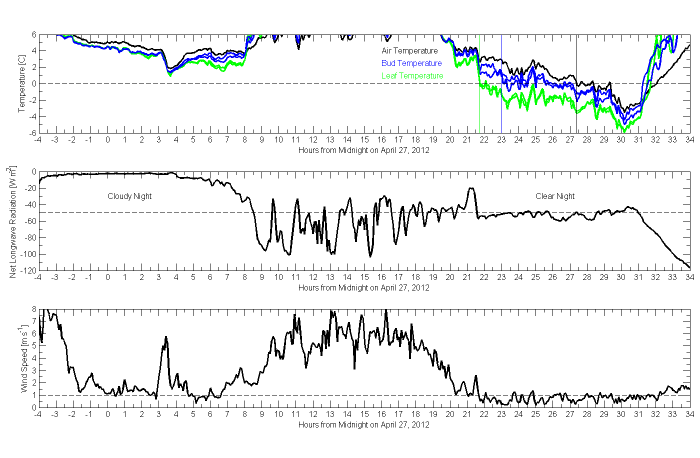 A third method uses a novel sensor such as the Radiation Frost Detector (SF-110, SF-421) from Apogee Instruments, Inc. This sensor simulates both a leaf and flower bud in a single probe, providing a direct estimate of these temperatures. Because this is a physical process, the important property simulated by the sensor is the emissivity—how well the leaf and bud emit radiation to the atmosphere. In this example, if a grower used air temperature alone, the frost warning could come hours too late on a clear night—unless a conservative temperature threshold for action is chosen. Choosing a threshold that is too conservative, however, runs the risk of taking an expensive action when it is not necessary. Coupled with the proper equipment, having an understanding of the mechanics underlying such an important process can help growers be prepared to minimize losses due to frost. With the critical spring frost season coming soon, now is a good time to make sure preparations are made. If you have any questions or comments about monitoring the risk of frost for your crops, post them below. Dr. Dirk V. Baker is an Application Research Scientist in the Environmental Group at Campbell Scientific, Inc. Areas of interest include ecology, agriculture, and meteorology—among others. He has a bachelor's degree in wildlife biology and a doctorate in weed science, both from Colorado State University. Dirk’s graduate and postdoctoral research centered around measuring and modeling wind-driven plant dispersal.